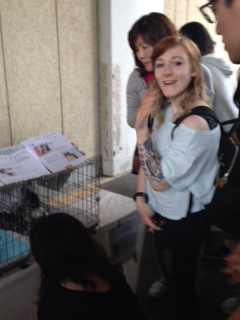 It seems to me that Japan has misplaced priorities when it comes to finding a pet a home. Pets are a significant part of a family and deserve love and attention in a happy home. Instead, animals are used as a huge business and profit is the main concern. It breaks my heart to watch just weeks-old kittens and puppies in tiny glass cages shouting and desperately trying to get the attention of someone who can save them. Many of these animals are separated from their mothers at a too-young age, which may leave them with emotional/psychological issues as well as a lifetime of illness or diseases. The fact that some cats and dogs are placed in strollers with various fancy clothing instead of allowing them to get essential exercises just further illustrates that the pets may be viewed as an accessory rather than breathing, living creatures. It is known that in Japan, many animals are gassed each year. Approx 82% off the　animals that end up in public shelters. In the UK, approximately 6% were killed. So what could be the reason for this significant contrast? In my experience in my country (UK),　most pet shops do not sell cats and dogs and the rate of people buying from breeders has significantly dropped. People usually find animals from shelters to adopt. With a good system of adopting pets in need (although the shelters may be very packed),it removes the need to just kill unwanted pets and make it easier to rehome them instead. Maybe if this became a movement in Japan, we could start to see less caged unhappy kittens in pet shops and more animals being kept alive.